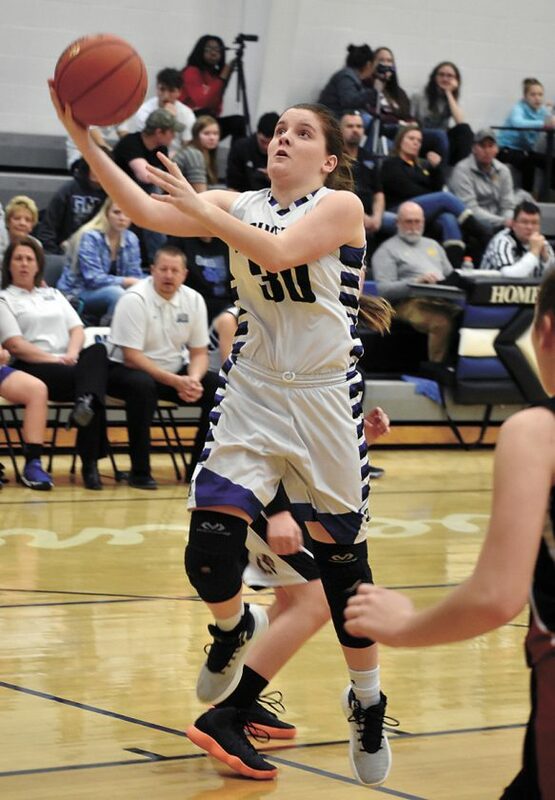 T-R PHOTO BY THORN COMPTON - GMG sophomore Emily Vaughn (30) goes for a layup in the second half of the Wolverines’ 50-49 loss to HLV in the Class 1A Region 4 opener in Garwin on Friday night. Vaughn had 10 points in the loss. 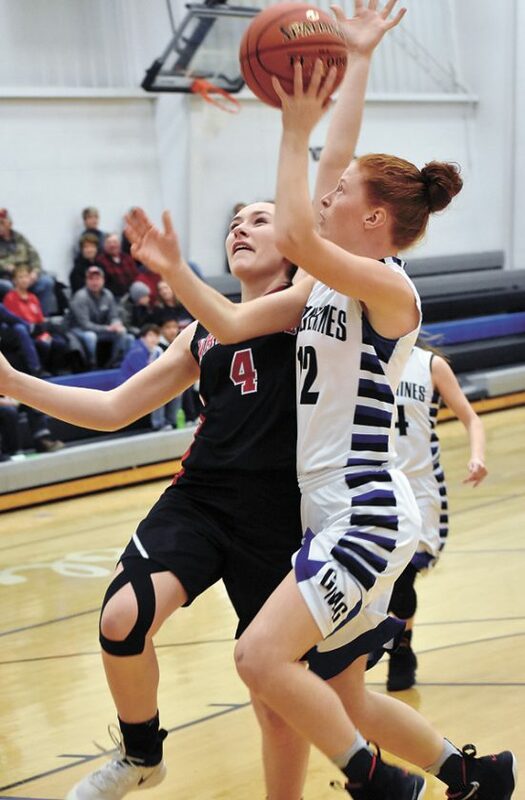 GARWIN — The GMG girls basketball team seemed like it had its Class 1A Region 4 opener against HLV in the bag with a 49-43 lead in the final minute of the game. The Warriors took a timeout and put a new set of personnel on the court, and that change with a new defensive look, a full-court press. The Wolverines watched as HLV scored, then pressed and stole and scored, and then again until with four seconds remaining the Warriors had taken a 50-49 advantage. 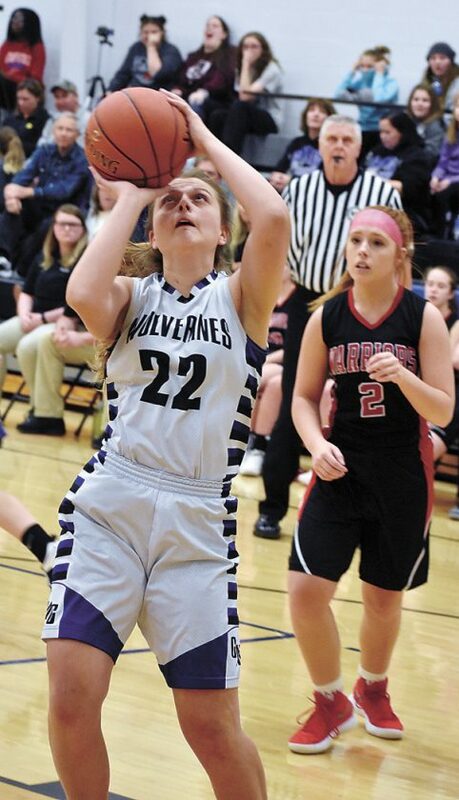 GMG got one final shot at it on an in-bounds play under its own basket, but a 3-pointer from Madi Krull missed its mark and the Wolverines were defeated, ending their postseason run before it began. 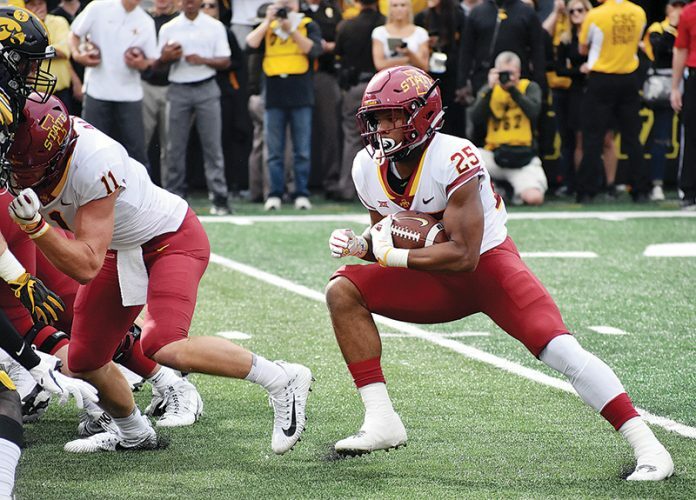 GMG head coach Justin Hornberg said even though he has a team laden with senior experience, it still wasn’t enough to stop the bleeding in the final minute. T-R PHOTO BY THORN COMPTON - GMG senior Kelsey Vaverka (34) pulls up for a shot while HLV’s Kayla Jack defends during the first half of the Wolverine’s 50-49 loss to the Warriors in Class 1A Region 4 playoffs on Friday in Garwin. Vaverka had a game-high 17 points. Warriors head coach Jay Malloy said he had been waiting all game for the right time to play his ace up his sleeve with the press, and it seemed the final minute down six points was the correct time to implement his plan. GMG (10-10) led for entire game until the final minute, but it never did enough to put the Warriors (3-17) away. Hornberg said the rebounding in particular was a killer, as they gave up multiple offensive rebounds for shots in the second half, but that wasn’t a surprise after how his girls finished the season. “I hate to say you could see it kind of coming with the last couple of games, but the lack of defensive rebounding and clearing shots off and allowing them to have as many looks at the basket as they want kind of showed up bad tonight,” he said. Kelsey Vaverka had a game-high 17 points in her final game for the Wolverines and Emily Vaughn followed with 10, but HLV didn’t make anything easy on the offensive end for GMG. The scoring for the Warriors all came in spurts. Karlee Timm led the way with 13 points, eight of which came in the third quarter. Haley Coats followed with nine points, all coming from three 3-pointers in the first quarter, and Tesla Malloy had eight, five of which came in the second half. Hornberg said it was Tesla who particularly hurt his team. With the loss the careers of a large senior class come to an end at GMG. 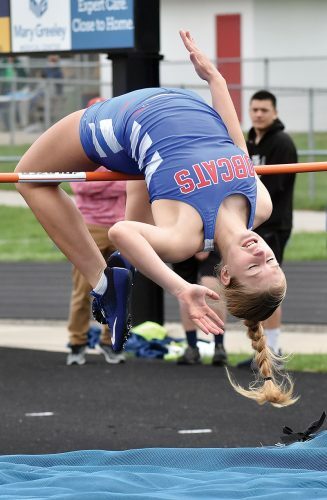 Hornberg struggled with his words when asked about what seniors Madi Krull, Zoe Duncan, Mable Dieleman, Tory Novotny and Kelsey Vaverka have meant for him and the program. 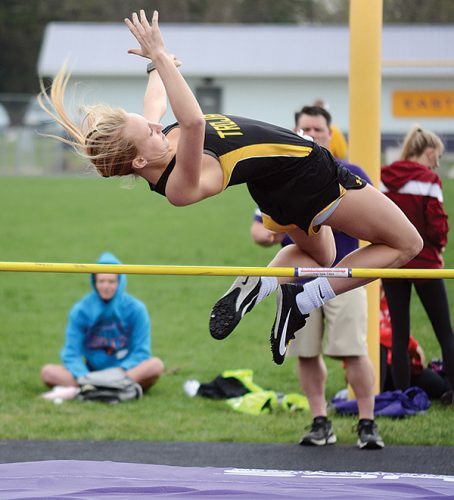 HLV (3-17) — Karlee Timm 5 3-9 13, Haley Coats 3 0-2 9, Kayla Jack 3 0-0 7, Jasmine Young 2 0-0 4, Lexus Van Thurnout 1 0-0 2, Olivia Van Waus 2 3-5 7, Aleya Roberts 0 0-0 0, Tesla Malloy3 1-2 8. TOTALS 19 7-18 50. GMG (10-10) — Madi Krull 2 0-1 5, Zoe Duncan 0 4-5 4, Mable Dieleman 1 1-2 4, Tory Novotny 3 0-0 6, Kelsey Vaverka 6 3-5 17, Belle Duncan 1 0-0 2, Emily Vaughn 4 0-0 10, Jordan Yilek 0 1-4 1. TOTALS 17 9-17 49. 3-Point Goals–HLV 5 (Coats 3, Jack, Malloy), GMG 6 (Vaverka 2, Vaughn 2, Krull, Dieleman). Total Fouls–HLV 18, GMG 14. Fouled Out–none.